You are here: Home / news / FOUND returns for 2012. In Autumn 2011 FOUND hit London with a landmark series of deeper, progressive programming, joining the dots between underground electronic genres with 13 back-to-back club nights at Vauxhall venue, Hidden. 10 promoters united to introduce over 200 artists from home and abroad, to represent the sounds of the future and cement FOUND as a home for cutting edge UK house and bass led electronic music. In 2012 FOUND continues to champion the deeper side of the club scene, as the series evolves into an ongoing established home for the most forward thinking British club sounds, maintaining a bi-monthly presence at its Hidden home. Returning are resident nights TRIX and Heritage alongside a host of new promoters covering the full electronic spectrum. 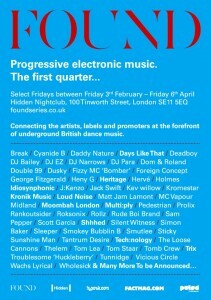 As FOUND advances, expect to be surprised by some game-changing one off events as the brand breaches Hidden’s walls and embarks on a musical journey across London in some of the city’s most exciting locations, with unrivalled parties and collaborations at the foundation (with a capital F:) of underground electronic culture.